A Trillion Dollar Coin for Your Thoughts? The one consolation for insanity is that it usually tends to come full circle and deposit an appropriate amount of egg on the face(s) of the most outspoken proponents. It is no different when the discussion of our broken monetary system comes up. Although I must say, the latest stunt is bold and daring and might very well threaten the one thing that underpins the global monetary system itself, and that is confidence, mixed with a good deal of ambivalence. 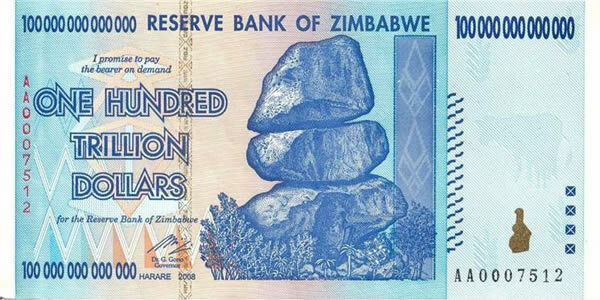 The idea of the US Mint creating a platinum coin and stamping a value of one trillion dollars reeks of the hyperinflationary situation in Zimbabwe where there are now hundred trillion dollar bills. At least the platinum is worth SOMETHING though, right? Not really when you consider the scope. In relation to a trillion of today’s dollars, the platinum is worth about as much as the metal used to make a video game token at an 80s arcade. Now before anyone gets too fired up, I must say that they haven’t actually decided to do it yet, but the idea is getting serious consideration and there is actually a petition on the White House’s ‘We the People’ section imploring the administration to take exactly that kind of action. I haven’t looked through the signers lately, but I am sure you’ll find quite a few mainstream Keynesian economists there. The whole idea behind this stunt to begin with is to relax the national debt and avoid (once again) the concept of actually dealing with out of control government spending. One must then wonder why the government would stop at one coin? Why not strike a roll of 20 and declare we have a surplus? For those of you chuckling, we’ve done similar things before. Some years back the government removed a couple of items from its balance sheet and declared the US government to have a surplus; a fairy tale that many still cling to today. So as funny as this concept might sound, it is well within the reach of the USGovt to try it. For those of you who are ready to go blind because of the insanity behind this proposal, there is good news. Things have come full circle. For as ludicrous as the idea of printing/minting our way out of debt, it contains the essence of the fiat money fiasco. Confidence. We always ask each other why would anyone accept little paper tickets for goods and services in which effort, materials, and capital were expended to produce? Confidence, that’s why. We’re confident that we can, in turn, take those tickets and exchange them for the goods we desire. I do it. So does everyone reading this column. At least most of the time. We do it even though we know that those tickets are losing their value because they are being overproduced. There was a time, now pretty much relegated to the annals of history, when we could exchange those paper tickets for silver or gold. But that had to be stopped because there wasn’t enough metal to cover all the tickets that were issued and the monetary ‘authorities’ had realized that the constant failure of banks back in the 1800s was caused by the redeemability issue. People were still plugged into reality, rather than their smartphone or RGIII’s blown out knee. Redeemability was the sunlight that shined on the vampire of fiat money and toasted it every time. So that was quietly taken away and the gold called in. Of course once the government had the gold, the dollar was quickly devalued. This is not much different. As of this writing platinum sells for around $1675/ounce. If the government actually goes through with its plan and strikes a trillion dollar coin, it will release a coin that is worth nearly (in dollars) 600 MILLION times what platinum is worth today. The face value of a platinum coin is $100. Striking a trillion dollar coin would devalue the dollar by a factor of around 10 BILLION. This symbolically represents an instant hyperinflation, although in practice, the conditions are not ideal for actual hyperinflation (believe it or not). This action makes FDR’s dollar devaluation look like small potatoes – the price of gold was only jacked to $35/ounce from the pre-confiscation price of around $22/ounce. What is laughable is the idea that our trading partners around the world would stand by idly and allow the USGovt to get away with such an action. Expect harsh reaction if our government actually pulls this stunt. We always figured they’d try to print their way out of debt, but maybe they’ll try to mint their way out instead. Doubly laughable is the idea that the fed would accept a single platinum coin in payment. The entire idea behind our fiat monetary system and its concomitant debt burden was to ensure that ‘We the People’ would spend ever-increasing portions of our labor effort to pay off debt that arose from the borrowing of money created from nothing. This $1T coin idea forces one to accept the idea that the fed takes orders from the USGovt and not the other way around. It is a very good bet that this will not happen – and if it does, there are plenty of other strings (either seen or unseen) attached. If you doubt this, consider if you were the lender. Would you accept such a cockamamie payment scam? I know if I were the lender I’d want at least two $1T coins (sarcasm mine). At the end of the debate, all of this maneuvering is being caused by several failures. First is the failure to recognize and come to grips with the fact that we don’t produce anywhere near what we consume and that it is causing structural imbalances. They can mint as many coins or print as many paper tickets as they want and it isn’t going to solve this problem. 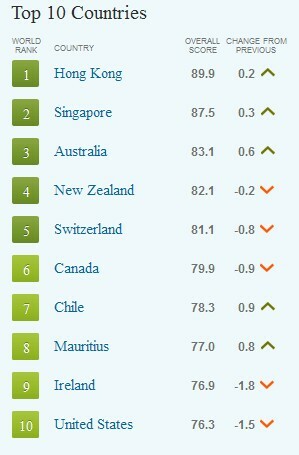 America recently ranked as low as #10 on the economic freedom scale. Many folks point to the lower wages in Asia as the only reason that US firms have moved jobs overseas. The reason we got #10 is because of the regulatory burden placed on businesses. I’d say that is at least as important as the lower wages in determining where the jobs go. Sure, wages play an important part, but they aren’t the only determinant and assuming the jobs will come back just because China has its own wage inflation problem is a bit shortsighted. There are other reasons. Secondly, we have a government that is hooked on spending and doesn’t really care where it gets the money. The taxes are starting to pile up now. Between the stunt New Year’s Day and the new taxes arising from the now effective socialized medicine mandate, more of our labor is going to be going to either insurance companies (primarily owned by banks) or the government (the enforcement arm for said banks). And these politicians are nowhere near done. There are three more ‘cliffs’ to deal with. Nothing was resolved on 1/1/13; things were only postponed a few months more. And the American people are going to pay dearly for those few months. One must seriously wonder how much longer this will go on before ‘We the People’ are dead from a thousand cuts. And finally, we have the issue of a good portion of the electorate loving all of this because they are the beneficiaries of the largesse. Not to mention the Warren Buffett types, who always seem to end up with massive loopholes in the latest tax schemes so they can be grandfatherly on television about how they want to pay more taxes, but almost never seem to do so. Speaking of which, old Warren has offered a personal guarantee that US banks will not get the country in trouble again. Hmm, you just have to love FASB Rule 157. It’s like financial fantasyland. I’ll bet Warren has a huge position he’s looking to unload. Bank stocks anyone?